This great pendant swivels so you can admire all aspects of the 3-dimensional design! In this class I supply a pattern for you to cut out of copper sheet. The curves of flame are forgiving, making this a perfect project to gain some sawing experience. Then learn how the U Curves from the MCME: Stage 2 class translate to working with sheet as you transform the sheet into this beautiful sculpture. You will also make a swiveling bail using these same concepts. Finally, add a heat patina to accentuate the look of flame and add beautiful character to the piece. Desert Jewel Studio, 26839 N 44th St, Cave Creek, AZ 85331. You will receive directions upon registering for class. This class is not on the schedule at this time. 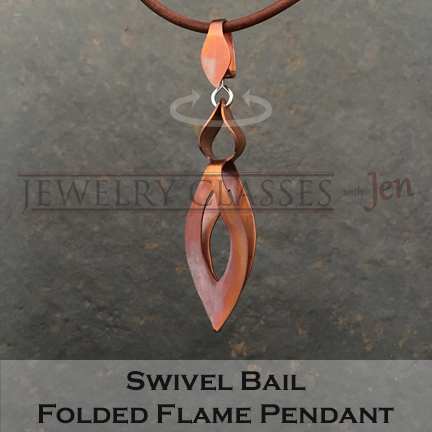 If you are interested in taking it, e-mail jen@jewelryclasseswithjen.com with your interest and availability. Class will be $65/person. E-mail jen@jewelryclasseswithjen.com or call Jen at (480)635-2402 to register any time from noon to 10pm. Magnifying glasses– most people don’t think they need them until they are faced with seeing the detail of jewelry close-up. The majority of the above items are available locally at C&D Silver, SJ Jewelry Supply, Lonnie’s Jewelry Supply or other on-line jewelry supply sources. If you have any difficulty or questions about obtaining any of these items, please contact Jen to inquire about your options.